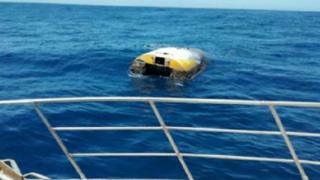 Almost nine years after being abandoned in the Indian Ocean, a yacht belonging to a teenage round-the-world sailor has turned up off southern Australia. US girl Abby Sunderland was aged 16 in 2010 when she attempted to become the youngest person to circumnavigate the globe, but a storm crippled her vessel. She was rescued more than 3,220km (2,000 miles) from the coasts of both Africa and Australia. The yacht was spotted on Monday, upturned and covered in barnacles. It was reported to authorities by a tuna-spotting plane about 10km south of Kangaroo Island, a popular tourist destination in South Australia, police said. “My heart skipped a beat,” Ms Sunderland said in a statement reported by Australian media. Ms Sunderland had set sail from California in January 2010, but five months later her mast snapped in 9m (30ft) high waves in the Indian Ocean. The teenager lost contact with her family for some 20 hours, during which time the yacht’s emergency beacons were activated. A plane from Perth spotted the teenager’s stricken boat and made contact with her, prompting a sea rescue. She was picked up by a French sailing vessel and taken to Reunion island, a French overseas territory near Madagascar. Ms Sunderland had been attempting to beat the record set by her brother, Zac, who sailed solo around the world in 2009 at the age of 17. At the time, her family rejected criticism from some over their decision to allow her to make the attempt, saying she was prepared and mentally well-equipped to deal with the challenge. The record was completed by 16-year-old Australian sailor Jessica Watson in the same year. Ms Sunderland has since co-written a book about her experience. She is now married with three children and lives in Alabama, media reports said.